Through 11 weeks this year, Aaron Rodgers has been the most dominant quarterback in the NFL and it is not even close. To see just how dominant Rodgers has been this season, take a look at the chart below. 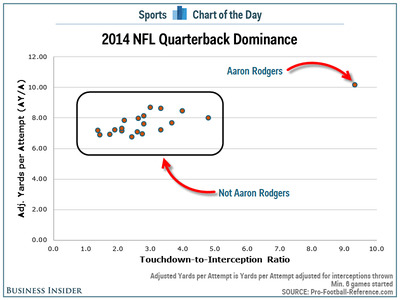 The chart shows two of the most important stats for a quarterback: 1) How many yards does his team gain every time he throws the ball (using Adjusted Yards per Attempt); and 2) How many more touchdowns does he throw compared to interceptions (using Touchdown-to-Interception ratio). In the chart, dominance increases from the bottom-left to the upper-right. While most quarterbacks are clustered together in the same area, Rodgers is off on another planet all by himself and he is doing it on a Super Bowl contender. That’s why Rodgers is going to win the MVP this year even though JJ Watt has shown a similar level of dominance at his position.